We also have our own direct sourced Colombian’s arrive at the beginning of the year, one of them the Los Naranjos has already received a lot of acclaim. And some of our most popular coffees are back. We have a number of new blends. Blends are our way of introducing the high quality coffees we source to everyone. Also we have learnt that single region, origin or estate coffees are to some people’s tastes, while blends seem to work for others. First stop was Sandpoint, ID where Diedrich are. The training was 5 days, and we learnt about their roasters, about finding the prefect profile for each coffee that we want to roast, and how there are over 1,800 chemical components that make up coffee, and we can manipulate 1,500 of them during the roast. We spent a lot of time learning about what makes a good, great and bad roast. How something as simple as the humidity and ambient temperature can change the way a green unroasted coffee bean roasts, and tastes after that roast. We spent time playing with how air flow across the bean, affects such variables in a coffee as brightness and when done properly flavours are retained by the coffee and can be enjoyed by all once it is brewed. We must have cupped (tasted) close on 50 roasts during the course, and got great experience in identifying nuances created by each roast profile. We also picked up valuable cupping experience, something we are keen to pass on in our future plans. After spending a week in Sandpoint, we popped in to Spokane, the second largest city in the state of Washington, before visiting the largest one Seattle. Seattle is the espresso capital of the states. There are more roasts per person in Seattle then anywhere else in the states. More machines are sold in Seattle than are sold in Milan, where many espresso machines are made. We had the fortune to visit a large number of them, mostly concentrating on the third wave of roasters. 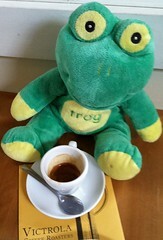 On the first day after drinking a few filter coffees, to start the process I stuck to espressos, having 13 by day end. We had coffee roasted in wood fired roasters, electric roasters, open flame and infrared roasters. 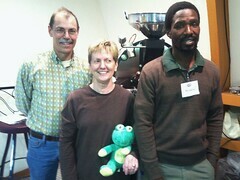 And there were many lessons that we learnt from visiting these roasters. The first thing that was obvious was quality is a first principle. No matter the roast philosophy quality is a core principle, quality coffee, quality roast and quality brewing. The Synesso and Strada espresso machines are the machine of choice. We saw more of these than there are in the whole of South Africa, in the first morning we were in Seattle. One place we went to weight every single dose of grind, and then even weight the espresso once it was pulled. And that was one special coffee. The next thing that is apparent is passion drives these roasters. They have all been to coffee farms, and are driven to only sell coffees they can trace back to the farmer. 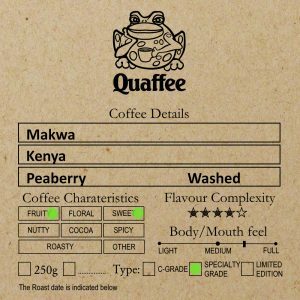 All the roasters we went to had at least tertiary qualifications, and where in coffee because they loved coffee. They were knowledgably and where excited to meet people that where passionate too. Why did Quaffee choose a Diedrich Roaster? Well to understand why the best place is to look at why there are Diedrich roasters. The Diedrich family owned a coffee farm in Guatemala in the 30’s the one brother moved to the states to start a coffee company where they would sell the coffees grown on the family farm. 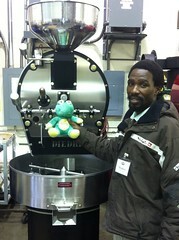 His son felt that the roaster was a weak link, and hence started tweaking the roasters. In the words of Steve Diedrich “when I was a kid, I would come into the lounge and find bits of roaster all over the floor”. Steve’s passion was aeronautical engineering. He went off and followed his dream and one thanksgiving, almost 30 years ago, came home to visit the family and got so fixated with sorting out the roaster for his dad (the son of the original Diedrich who sold coffee) and his brother, who was working in the business that he re-engineered the roaster, so that it was easy to clean and used clean infra-red heat. Today almost all the modern roasters are moving away from direct heat, and using the infra-red clean heat. Since this is firstly more efficient and secondly keep the heated air pollutant free. The Diedrich roasters, were the first roasters to concentrate on making things to aeronautical engineering standards. From the barrel to the chassis everything is made precisely and to and exacting standard. The end goal of the roaster is to produce a clean control roast that imparts the best to the bean, showing respect to the growers that spend most of their year growing the coffees, we roast.So we choose Diedrich roasters since they are a pure exhaust fume free roaster, with a controllable air flow, and rugged barrel engineering.